So you think you want a bloodhound? Before you rush out to buy yourself one of the cutest puppies imaginable, please do a bit of research & if possible go and meet some hounds in the flesh. People are often astounded by their size, capacity to drool and energy levels. They are DEFINITELY NOT the porch dogs that are portayed on shows like the Beverley Hillbillies. Below are a few things you should take into consideration when deciding if a Bloodhound is the right breed for your home, family & circumstances. Providing enough exercise and mental stimulation. Bloodhounds MUST have regular opportunities to vent their energy and do interesting things. Otherwise they become rambunctious and bored -- which they usually express by baying and destructive chewing. Bored Bloodhounds can turn your house and yard inside out in a single day. I strongly recommend that Bloodhound owners join their local tracking club and get their magnificent hounds involved in this potentially lifesaving activity. Bloodhounds were never intended to be simply household pets. Their working behaviors (sniffing scents, chasing things that run, exploring, baying) can be a nuisance in a normal household setting. Trying to suppress these "hardwired" behaviors, without providing alternate outlets for their energy, can be difficult. Bounciness. Young Bloodhounds (up to about two years old) can be bulls in a china shop. When they romp and jump, they do so with great vigor, and things can go flying, including people. Providing enough socialization. Bloodhounds need extensive exposure to people and to unusual sights and sounds. Otherwise their natural caution can become shyness, suspiciousness, or occasionally aggression, which are all difficult to live with. Stubbornness. Bloodhounds have an independent mind of their own and are not pushovers to raise and train. Most Bloodhounds are extremely stubborn. They can be manipulative, and some are dominant (they want to be the boss) and will make you prove that you can make them do things. You must show them, through absolute consistency, that you mean what you say. Confinement. To keep your Bloodhound in, fences should be high, with wire sunk into the ground along the fence line to thwart digging. Bloodhounds cannot be trusted off-leash. They will take off -- oblivious to your frantic shouts -- after anything that emits an odour or runs. Housebreaking. 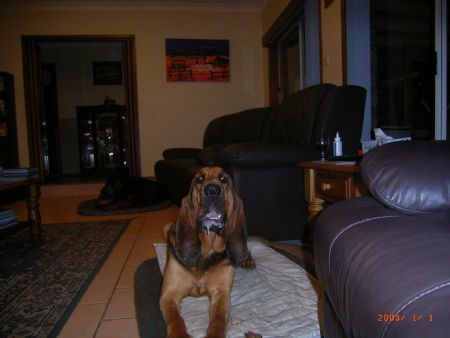 Bloodhounds tend to resist being told what to do, and housebreaking is no exception. Expect four to six months of consistent crate training. Noise. Bloodhounds should never be left outside in your yard, unsupervised for extended periods. Their deep voice is extremely LOUD and carries a long way. Their baying will have your neighbors calling the police to report the nuisance -- or quietly letting your Bloodhound out of his yard so he'll wander away. Houndy odor. Bloodhounds, like most hound breeds, have a "doggy" odor that some people find disagreeable. Slobbering. Most people are not prepared for how much Bloodhounds slobber and drool, especially after eating and drinking. Serious health problems. From hip problems to heart disease to stomach disorders like bloat, Bloodhounds are risky in the health department. Most reputable breeders who health tests their breeding stock are doing their utmost to reduce the incidences of these health issues....but genetics can deal a bad hand even to the most consciencious of breeder. If you are seriously interested after reading all of the above, I would suggest that you meet some hounds in the flesh. If you live close enough to me, then I would encourage you to come & see if this breed is truly what you are after. One strong warning I must give & that is that a bloodhound DOES NOT do well on it's own...I normally would not recommend a pup go into a home without another dog as a companion. They are pack hounds & due to this fact they really need company of another dog! NOTE: NO Hunterhound pup will be sold to hunting homes, so please don't bother contacting!